The 350i sports car. 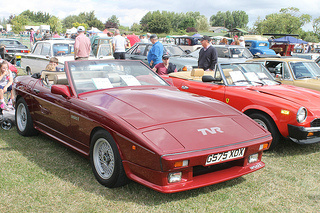 Peter Wheeler, the new owner of TVR, realised that, following the introduction of the wedge-shaped Tasmin in 1980, the new radical design was not well received by the market. However, with no additional funds available to create a new car with more conventional styling, he decided to retain the existing range, and concentrate on producing variants with increased performance. In 1982, it was felt that a more powerful version of the Tasmin 280i was needed, and so, in August 1983, the Tasmin 350i was introduced. It used the same chassis as its predecessor, which was a stretched version of that used in the now discontinued M-Series, while the body, still retaining the wedge shape concept, underwent minor modifications. 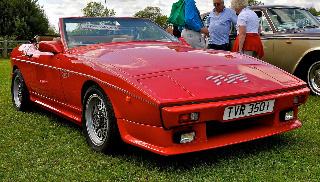 In 1984, when the Tasmin name was no longer used on the TVR 280i, this change was extended to the TVR Tasmin 350i, which was now designated the TVR 350i. This new variant was powered by the 3.5 litre, Bosch K-Jetronic fuel injected, Rover V8 engine, which developed 197 bhp at 5280 rpm, and 220 ft/lbs of torque at 4000 rpm. It produced a top speed of 136 mph, with a 0-60 mph time of 6.3 secs, a 0-100 mph time of 16.5 secs, and a standing quarter mile time of 14.8 secs. With a compression ratio of 9.7:1, it had disc brakes all round, and was available as a two seater fixed head coupe or convertible. The advantage of using a Rover rather than a Ford engine was that it offered the opportunity of marketing the 350i in Arab countries, who would be less inclined to purchase a product with Ford content owing to the latter's association with Israel. The creation of the 350i meant that TVR was now back in the business of building a V8, for the first time since the Tuscan V8 was phased out in 1969. Following the 350i's launch, one of the popular Motoring magazines described the car as "The finest sports car since the Ferrari 275GTB/4". It is interesting to note that the 350i would eventually turn out to be the best selling car ever made by TVR. Built alongside the existing TVR 280i, the 350i offered a significant increase in performance over its predecessor. Although sales of the 350i in 1983 began well in both the UK and US markets, it was not sufficient to return the company to profitability. Furthermore, by 1985, a combination of massively increased shipping costs, further UK legislation, and an adverse exchange rate, meant that exporting to the US was becoming unprofitable. Accordingly, the company discontinued exports to the US, and concentrated its sales efforts on the UK market. 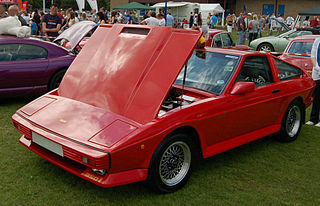 In the mid 1980's, a non TVR factory source fitted a Sprintex supercharger to a 350i, together with uprated brakes, and which was duly designated the TVR 350SX. It is understood that only between nine and twelve units of this variant were ever built. Furthermore, it has been estimated that the output from this engine was in the region of 260 bhp. 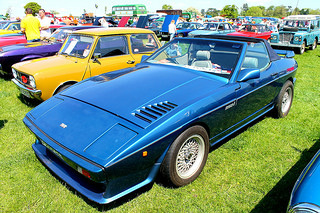 Production of the TVR 350i ended in 1989. A 1983-89 TVR 350i in good condition would fetch in the region of £12,000/$19,000, although a high mileage example would b valued at only £5,000/$8,000.